My grandmother and I would take the 21-Hayes bus downtown to shop at the Emporium in the early 1970s, and she would tell me how she used to go to Mid-Market and the Tenderloin to see movies, listen to music, and dance. This was difficult for me to grasp as a child—and not only because my grandmother did not look the flapper type. The theatres that still operated on Market Street showed adult films, and the once stately buildings in between housed shabby Army surplus outlets and knock-off camera stores. Just as the city changed dramatically from my grandmother’s prime to my childhood, San Francisco has again remade itself just in my adulthood. Anyone with a ten-year tenure in the city will agree, as towers loom over South of Market, $30 cocktails are served in the Mission, and private jitney vans weave with Ubers and Lyfts through the Western Addition. For a long time it felt the Tenderloin would stay the same, surrounded by wealth and upheaval, but more a victim than a beneficiary of the money pouring into town. While an extremely diverse neighborhood, it is still where the intractable and shameful sides of our modern society are most on public display, as those who live on the margins, who suffer from homelessness, drug addiction, mental and physical illness, and poverty, are crowded together, pushed out of gentrified neighborhoods, priced out of the new construction. It is also home to thousands of children. This time it seems to be working. On the old corner where San Franciscans like my grandmother once came to dance and play, now senior citizens stretch, children run, and a little sunshine slips through the apartment towers. Boedekker Park. Courtesy of Sherwood Design Engineers. 1. “Downtown Bowl Shuts Its Doors,” San Francisco Chronicle, July 12, 1977, pg. 45. 2. Bill Mandel, “Bowling is Spare-time Fun Again in Suburbia,” San Francisco Examiner, May 11, 1986, pg. 20. 3. Marshall Kilduff, “Supervisors Act on Tenderloin Park,” San Francisco Chronicle, June 28, 1983, pg. 2. 4. 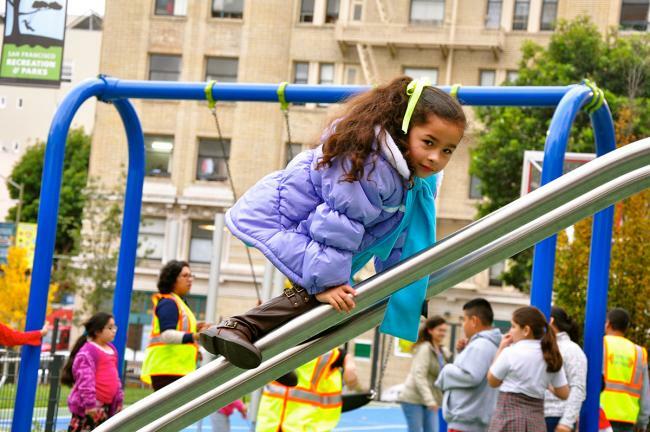 John King, “Tenderloin Likes its Reborn Park,” San Francisco Chronicle, August 5, 2015, pg. D1.